Handcrafted and hand-painted artist signed Gourd Art Basket with patriotic stars & stripes flag butterfly motif and cork stopper. This patriotic art gourd was handcrafted and signed by a talented artist "Adams" from Savannah, Georgia area - home of the Savannah College of Art and Design. The body of this organic gourd was left in its natural color, and the entire gourd given a light protective coat of polyurethane to protect both the gourd and the fine artistic painting on the front. The design of this basket gourd art lends itself to many uses. The gourd was dried, thoroughly cleaned on the inside, and an area in the top precisely cut to hold the cork stopper. 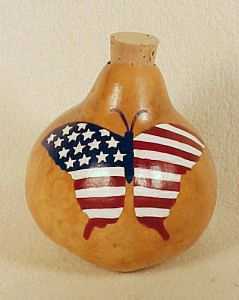 The hand-painted butterfly on the front, with the Stars & Stripes Flag motif and in patriotic colors of red, white and blue make this decorative gourd perfect as a centerpiece for the holidays, a unique one-of-a-kind addition to your painted gourd collection, or it could be used as a vase filled with dried flowers. Don't miss your chance to own this fine artist signed gourd art basket. You can read more about Gourd Basketry & Gourd Art Baskets here. This fine Gourd Art Basket with the hand-painted stars & stripes flag butterfly measures 5.75" to the top of the gourd and is approximately 5" wide. Signed on the bottom by the gourd basket artist.